If there’s one thing to rival food in Saigon (Ho Chi Minh City) it’s coffee. With the queues outside the city’s first Starbucks outlet all but gone, it’s time to have a look at Saigon’s thousands of independent coffee shops. Hidden down narrow alleyways, tucked away in forgotten colonial villas, or concealed in enigmatic old apartment buildings, there’s a whole sub-culture of ‘indie’ cafes in this city. These coffee shops offer a unique kind of ambience, décor and intimacy that the ever-increasing number of international coffee chains in Saigon can never compete with. 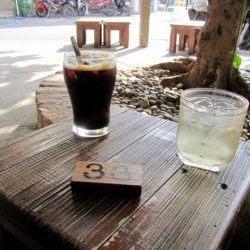 In a city bursting with coffee shops these are my 15 Best ‘Hidden’ Cafes in Saigon. After visiting dozens of coffee shops over the last month I’ve come to realize four things. 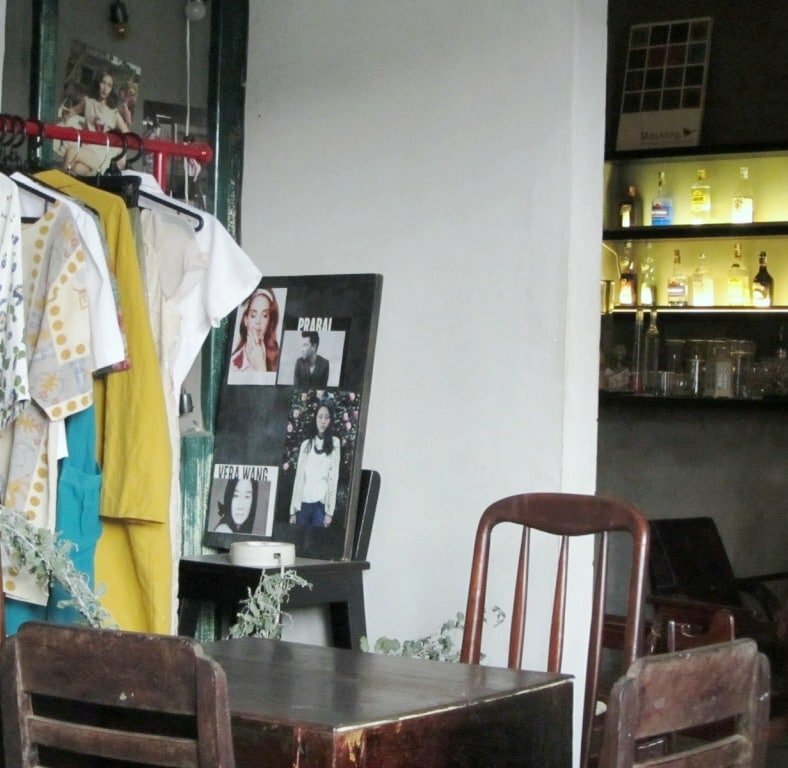 Firstly, Phú Nhuận District is Saigon’s unofficial ‘indie’ cafe area. Secondly, these cafes are less about the coffee, more about the environment. 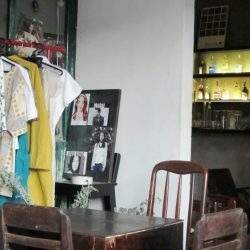 Thirdly, Saigon’s ‘indie’ cafes are not just daytime hangouts; the majority are open late into the night, and many have live music performances. And lastly, most independent cafes fall under one of these three categories: garden cafes, nostalgia cafes, and ‘modern’ cafes. 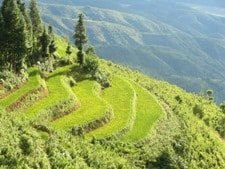 Garden cafes try to recreate the peace and serenity of rural Vietnam. 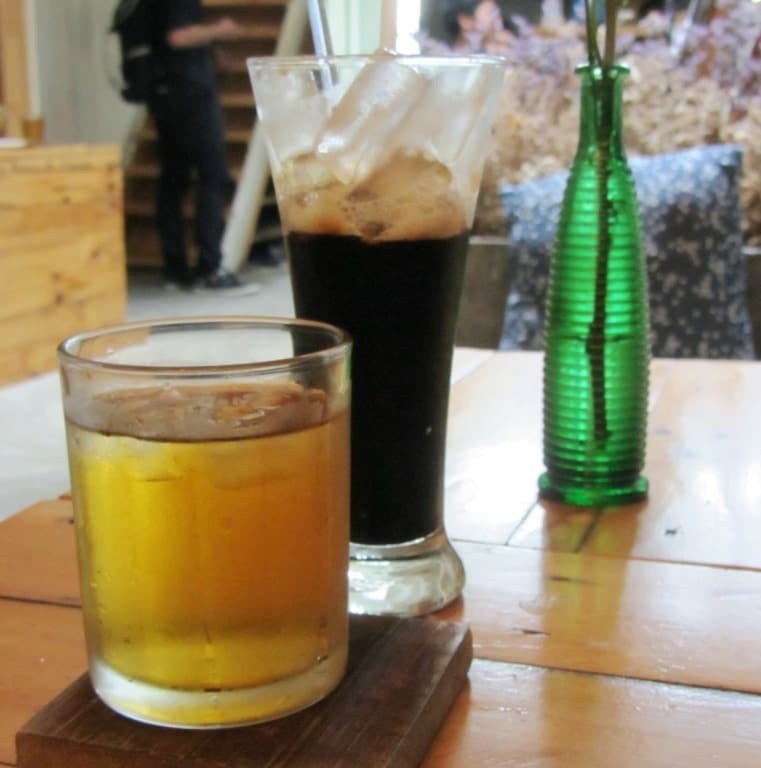 Nostalgia cafes focus on the past – whether it’s 1960’s Europe or medieval Southeast Asia. 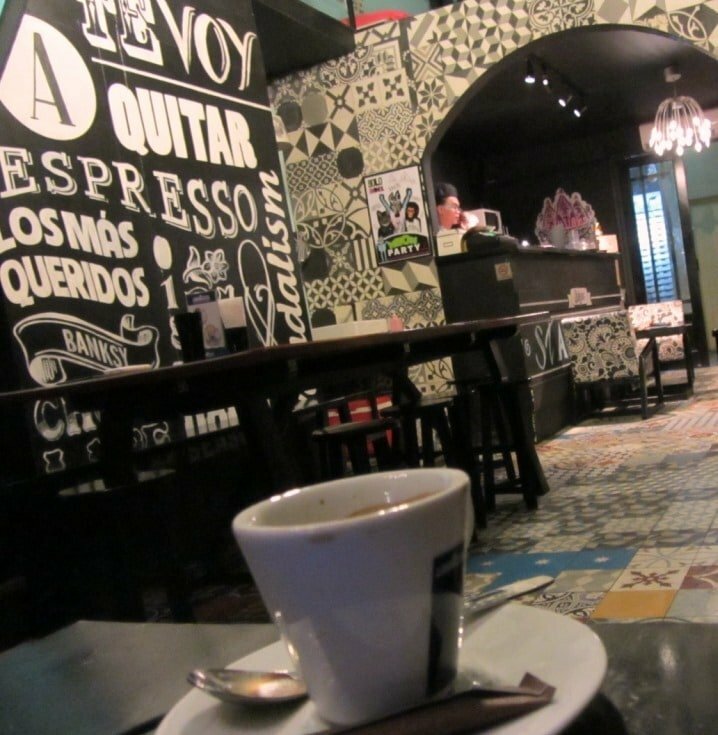 ‘Modern’ cafes often have a theme: an artistic or architectural movement, a famous band or person, a nation or religion. All of the following cafes have Wi-Fi, and you could quite easily spend the whole day working, socializing or relaxing in any one of them. 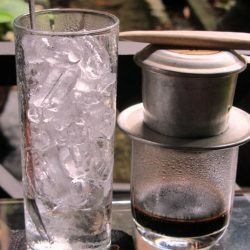 Vietnamese have a love of quán café sân vườn, which means ‘garden café’. 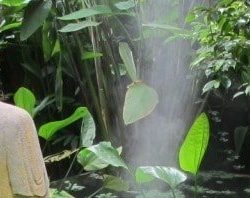 Trầm Café is the perfect realization of this concept: a lush, hidden, tropical world in the middle of Vietnam’s biggest, busiest city. Multi-leveled and labyrinthine this coffee shop is a genuine oasis where you can swap the roar of motorbikes for the trickle of water and rustle of leaves. Outside seating, under the canopy of trees, remains cool in the dappled sunlight of even the fiercest of dry season days. 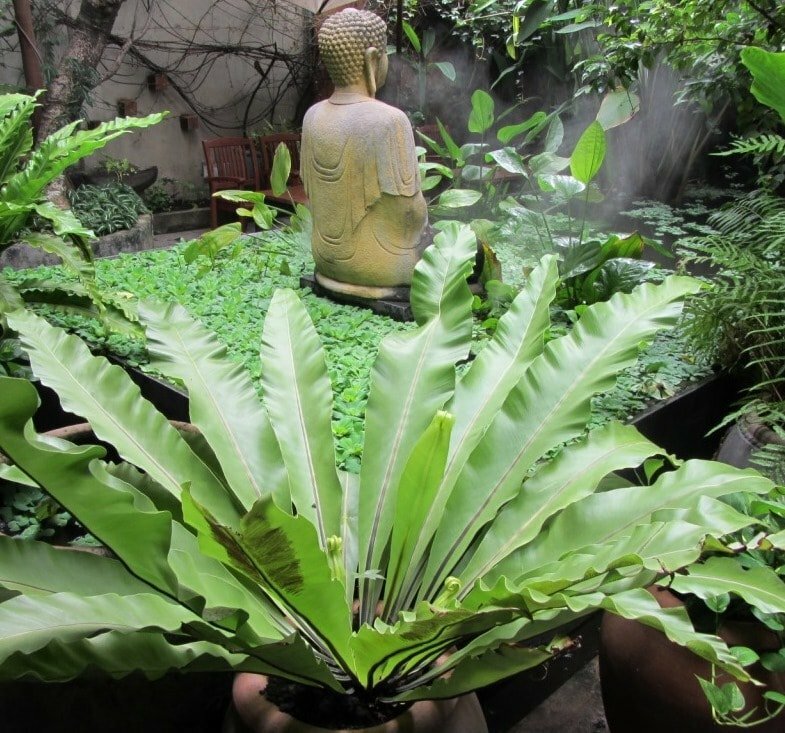 Raised wooden walkways lead from one ‘tree house’ to the next and stepping stones guide you through tasteful water features, adorned with reclining Buddhas, giant earthenware vases and faux classical busts. The walls, pillars and windows are dripping with foliage, and lanterns hang from branches and trestles, swinging gently in the breeze. Inside seating is cosy, cushioned and softly lit like a plush, first class dining car on a Victorian train. 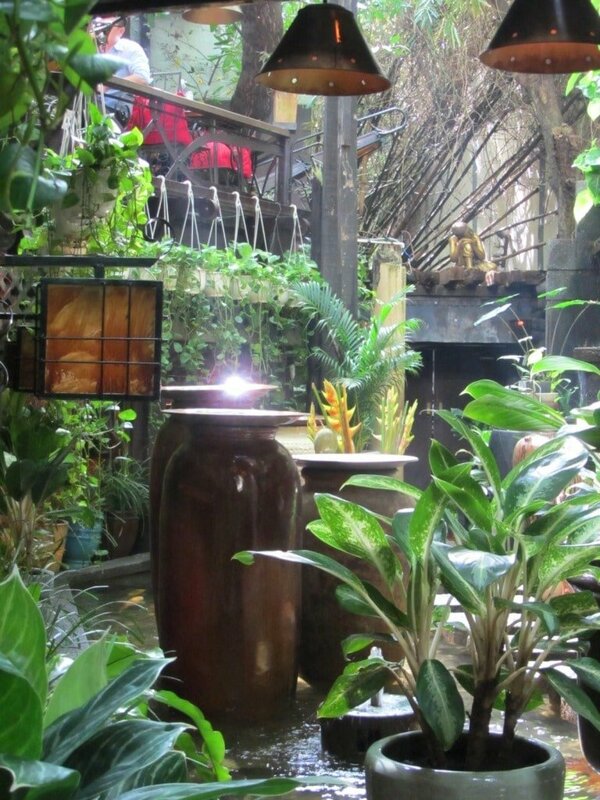 Hundreds of other garden cafes in Saigon aim for the same aesthetic, but most of them miss the mark and end up straying into the kitsch and the sentimental. Trầm Café is the only one that manages to convincingly keep up the façade of a natural, peaceful environment despite being a man-made one in the middle of a concrete city. On the downside, the coffee is expensive (40,000VNĐ/$2) and bland, and awful pop music – totally at odds with the general mood of the café – is sometimes played indoors. Cool, hip, and hidden Mocking Bird is what all independent cafes should be. Up four flights of dark, dank concrete stairs in a run-down apartment block that looks like it’s slated for demolition in downtown Saigon’s financial district, Mocking Bird is an unexpected ‘eagle’s nest’ with views over the ‘soviet-gothic’ architecture of the State Bank of Vietnam, which itself looks as though it’s been abandoned; sculpted busts of Lenin and Uncle Ho are just about visible through gaps between heavy, dusty, drawn curtains. The entrance to the café is off a dark corridor with the distinct smell of dog pee. But don’t worry, once you enter through the wooden doorway – decorated with a pine branch intertwined with bare light-bulbs – Mocking Bird’s trendy, diminutive space is another world. With flowery, hippy dresses on coat-hangers, concrete walls decorated with chalk and paper murals, wooden tables and chairs on cold tiled floors, naked light-bulbs hanging from the ceiling, and a few brooding fashion snaps plastered here and there, it feels like entering the dorm of a creative student from 1960s Britain, or being backstage at a small-scale but exclusive fashion show. 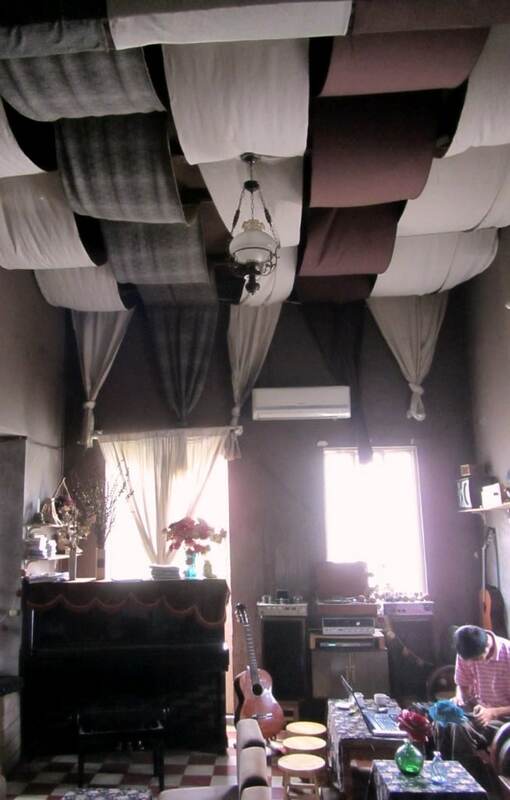 It has the cosy intimacy of a study, and the space is just about chaotic enough to feel ‘lived in’. Amy Winehouse and some soulful classics suit Mocking Bird’s cool but mellow space well, and the coffee is good but small. Alcoholic cocktails are also available, and the little, leafy balcony with fairy lights makes this a good place to bring a date. Prices are between 30-50,000VNĐ ($1.50-2.50). 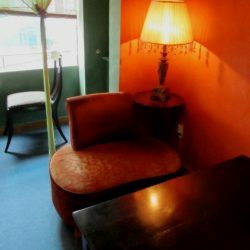 Named after the famous British street artist, Banksy cafe is a colourful, stylish little place that’s very different from the other coffee shops in this aging apartment building. Books about Banksy line the shelves and there are some Banksy-related photographs and canvases on the walls. Psychedelic murals and snazzy seat covers attempt to create a ‘graffiti’ environment. I love the concept of this café but it could have been better executed. For example, it would be great to see some Banksy-inspired Vietnam-related street art on the walls here, or even just some reproductions of Banksy’s own work. Western-style espresso coffee is available and prices are between 30-50,000VNĐ ($1.50-2.50). 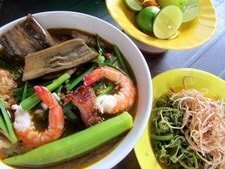 Another of Saigon’s well-hidden cafes Vừng Ơi, Mở Ra is on the first floor of an old, decaying French villa on a street known for its many cafes near the city centre. 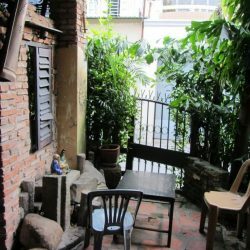 Accessed off a dead-end alleyway, through a street-kitchen and up a narrow staircase, this is a very private, cosy café not far from District 1. 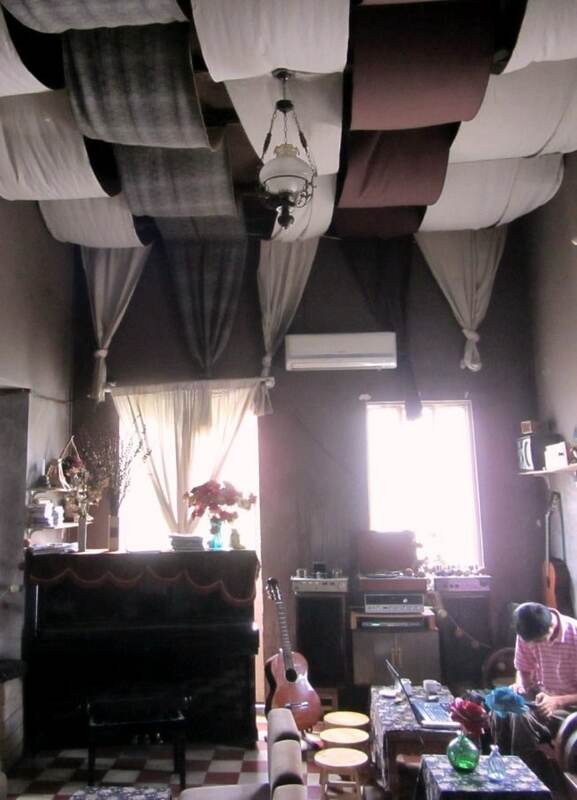 The ceiling is hung with undulating strips of patterned material like the interior of a kasbah. Walls are adorned with prints, etchings and sketches depicting anything from historical figures and events to movie stars. The tiled floor and walls are left deliberately grubby for that ‘artist studio’ look. 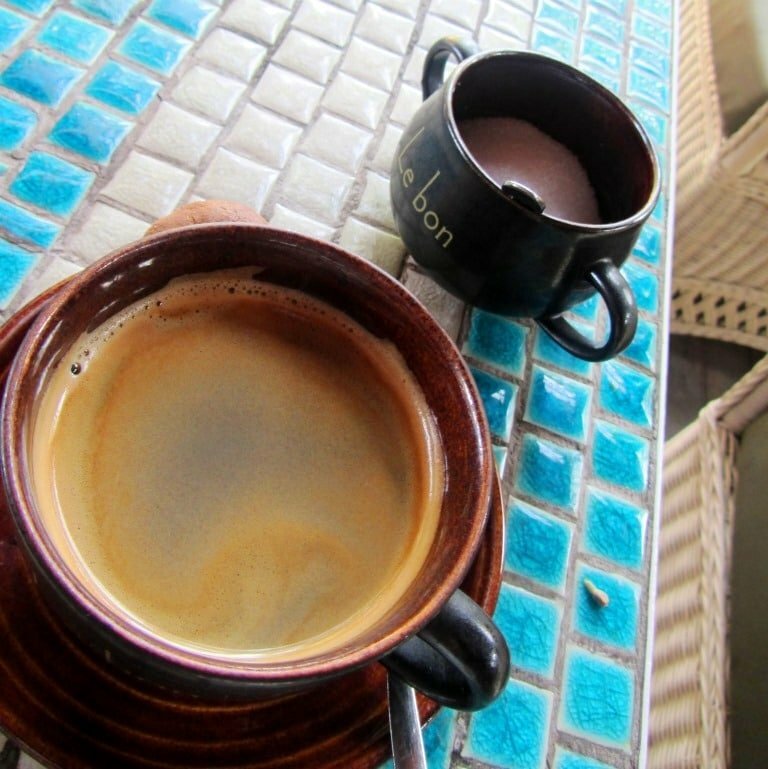 There’s plenty of seating on cushioned chairs and the coffee here is chocolatey, rich and smooth (35,000VNĐ/$1.50). During the daytime, when the cafe is quiet, you’re free to pick up any of the instruments and have a go. Live music nights by candlelight are an intimate experience with piano, guitar, vocals and violin filling this small café. 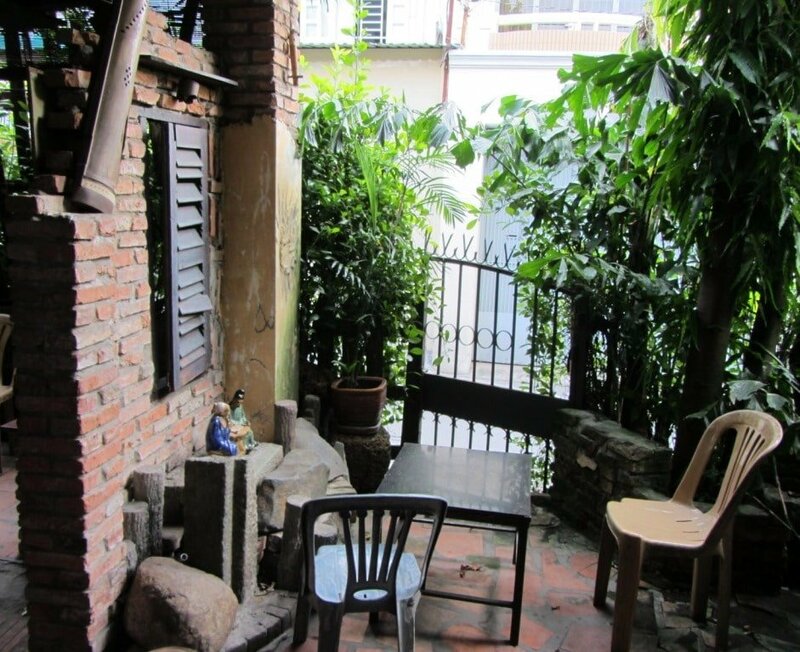 Even further down the same alleyway as Vừng Ơi Café – and even more hidden – is Ngôi Nhà Số 7. 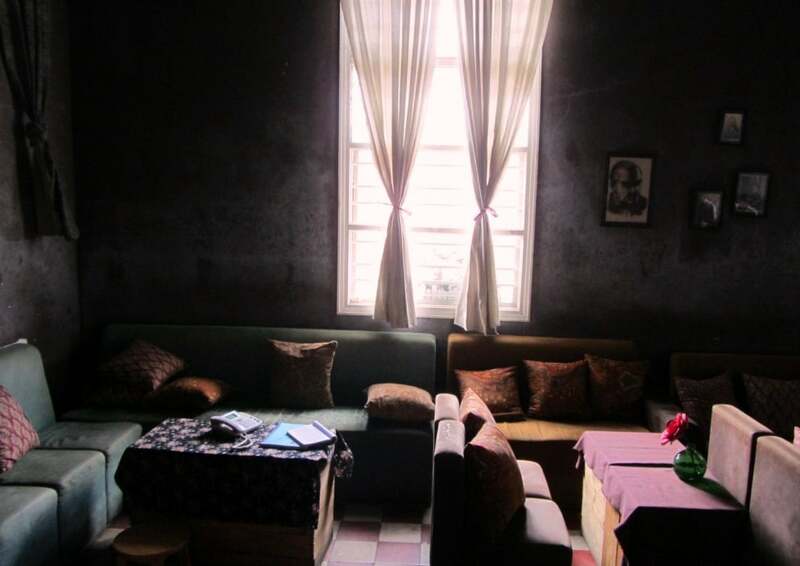 On the ground floor of yet another fading French colonial villa, Ngôi Nhà is accessed through a backyard full of domestic clutter leading onto a tiny wooden door. Inside it’s bright, quiet, comfy and convivial. 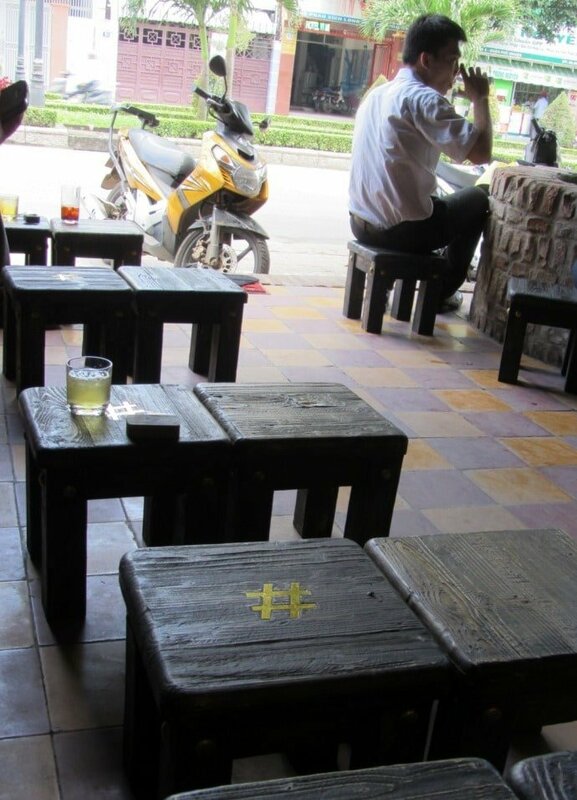 Vietnamese students at leisure – gossiping, reading or working together on university projects – sit on cushioned benches at small tables made from planks of brightly varnished wood. There’s a raised mezzanine level running along the walls where you can sit on cushions on the floor. The owners have made this small room into an airy, bright space that, during the daytime, has the feeling of a glass conservatory or converted loft. At night there’s live music on the small stage at the centre of the café. Coffee is good (35,000VNĐ/$1.50) and service is friendly. 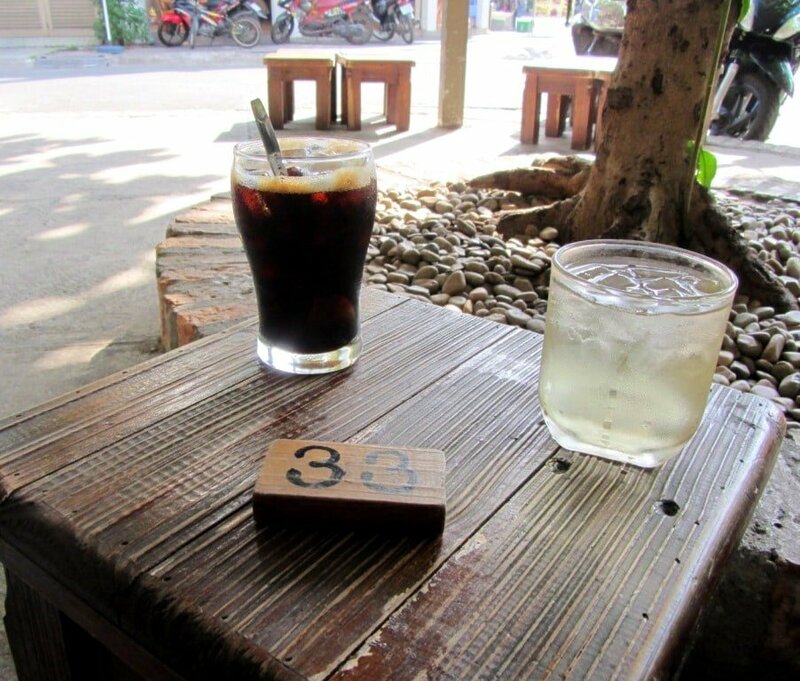 Far from the city centre, Ngày Xưa Ấy Café is worth the effort it takes to get here. 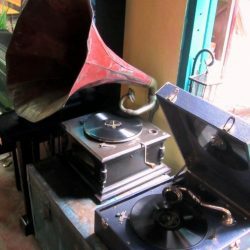 Down a narrow alleyway off one of the burgeoning roads behind the airport in Gò Vấp District, this trinket-filled coffee shop is a tribute to yesteryear. Whether it be Asia or Europe this café focuses firmly on the past, and the result is a fascinating museum of nostalgia in a city that’s charging towards the future. The pretty, gated entrance leads into a tight, leafy courtyard dotted with stone mandarins, potted plants, clumps of bamboo and twittering caged birds hanging from branches. But inside is where the treasure lies. Attractive antique wooden tables and chairs sit under an old ceiling fan, rotating slowly, blowing the dust off traditional Asian stringed instruments, old clocks, incense burners, ancient portable T.Vs and telephones, gramophones and records players, paraffin lamps, typewriters, soldiers’ canteens, coffee grinders and teapots, busts of Buddha and sculptures of mandalas, larva lamps, toy trains, pith hats, antique cameras and abacuses. It’s a small space jammed full of memorabilia, but it doesn’t feel cluttered. 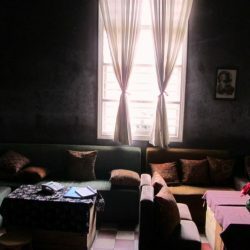 Up a very steep stairway there’s a cosy loft – filled with dolls and watched over by a portrait of Uncle Ho – where seating is on cushions on the carpeted floor. 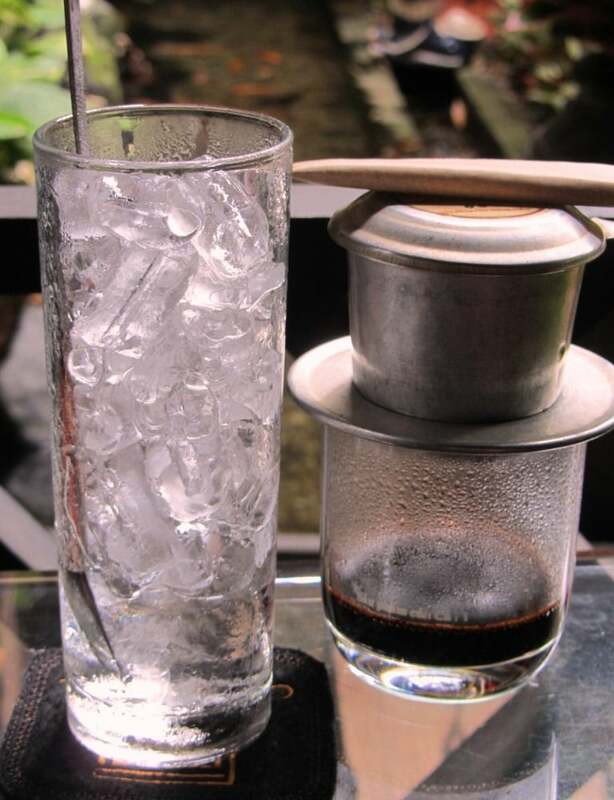 The coffee is cheap (19,000VNĐ/$1) and has a fuller, richer flavour than in most other cafes. I’m told live music here on the weekends is very good too. 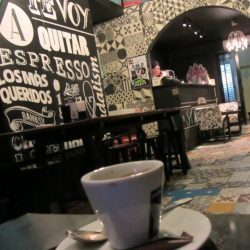 [Note: this cafe recently changed location (to the address given above) and I haven’t yet had a chance to visit the new space: the following review is of the old location, but hopefully the new one is in a similar style. 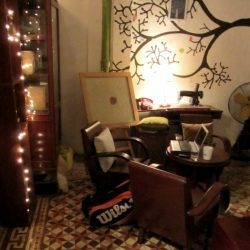 For the time being, I’ve removed the marker from my cafe map] Down an interesting alleyway in District 1, just a short walk from the backpacker area of Phạm Ngũ Lão, The Tibetan Coffee Shop is full of trinkets, photographs, and artwork with a Tibetan theme. 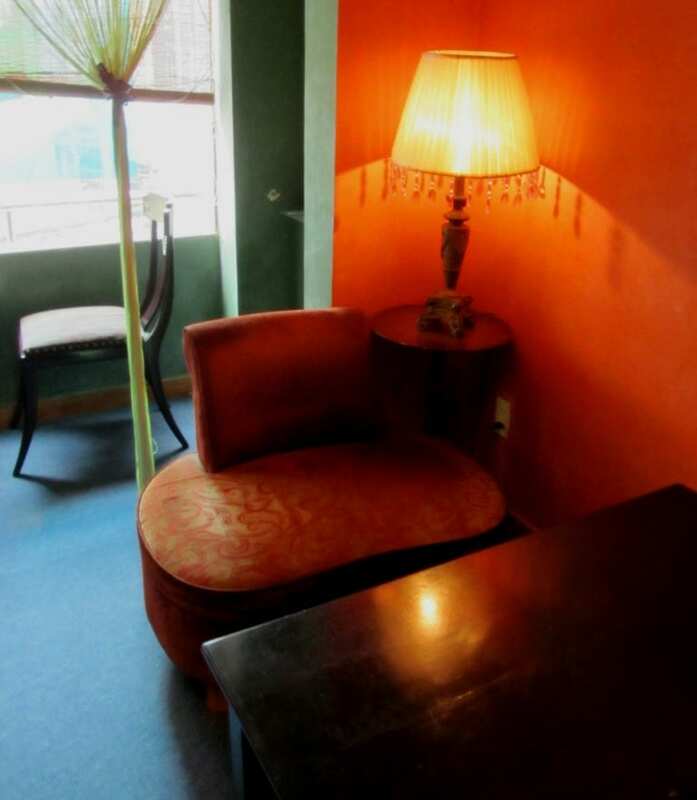 It’s a plush café with ambient, soft lighting, pastel-coloured walls, carpeted floor, drapes and blinds over the windows, and even a Tibetan altar upstairs. The menu includes some interesting South Asian items, such as, traditional Tibetan tea and Masala ‘chai’ tea, however, the latter tasted more like a very milky English Breakfast tea than the subtly spiced drink it’s meant to be. At an average of 40,000VNĐ ($2) prices here are quite high. I once visited a beautiful Tibetan tea house inside the Tibetan Government in exile complex in McLeod Ganj in northern India, and this coffee shop in Saigon goes some way to reminding me of that one, so it must be doing something right. Owned by the same people as the popular Mộc Hi-End Café on the opposite side of the street (which is also a good place for a coffee in cool, retro surrounds) Ghế Đẩu, which means ‘stool’ in Vietnamese, is a shady, leafy outdoor café occupying a crescent of concrete on the corner of two residential streets. 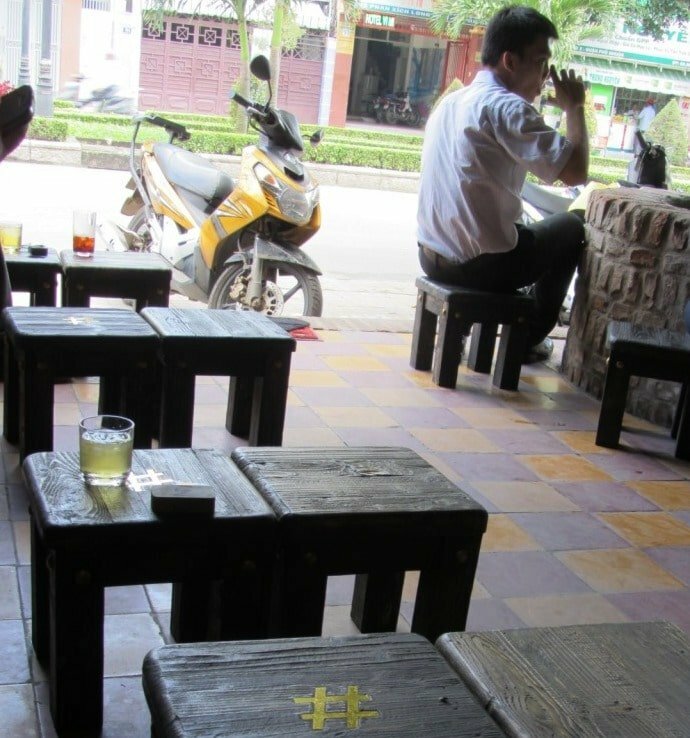 Seating is exclusively on low wooden stools of the kind that has become extremely popular and trendy in Saigon over the last few years. 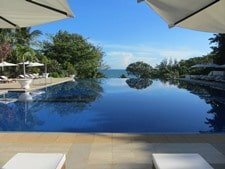 In a casual atmosphere under a tropical almond tree and three small Bodhi trees this place attracts a young crowd, especially in the evenings when it’s a hive of well-dressed youth chattering together or consumed by various portable technologies. At this time of day it’s irresistible; you can’t help but want to be a part of it. During the day time it gets busy with local businessmen and older men playing mahjong. The coffee (10,000VNĐ/$0.50) is pretty good, but most people choose from the extensive list of fruit shakes and smoothies (sinh tố). In a very affluent-looking area full of villas and small businesses, Côi Xưa is a garden café in the style of a crumbling traditional Vietnamese rural home. 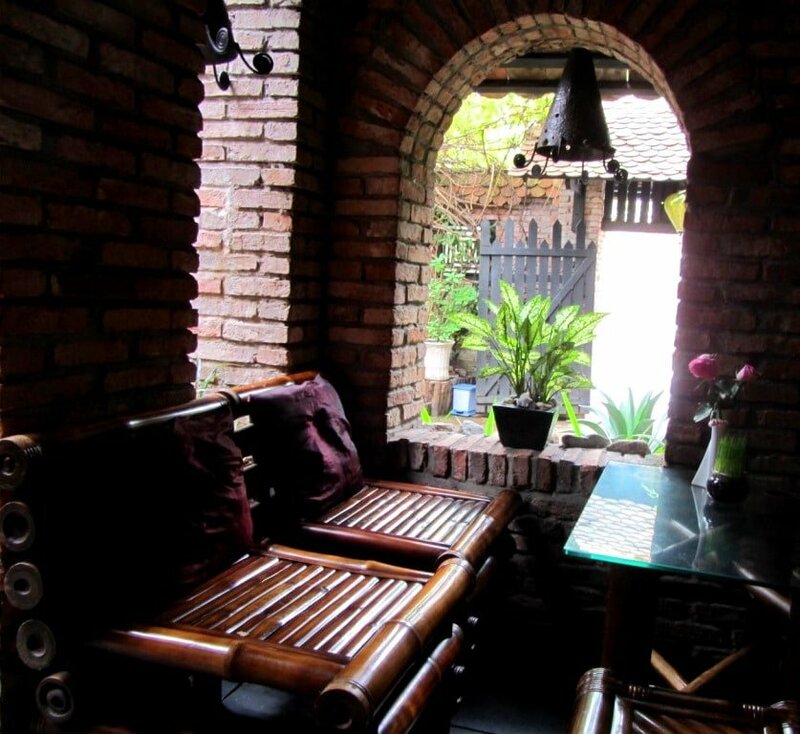 Varnished bamboo furniture, wooden shutters, water features, lanterns, and half-ruined brick walls help to create the impression of an old house in a romantic state of decay. The open courtyard is leafy, shady and cool. Unfortunately, the mood is tarnished slightly by sugary pop music. Coffee (30,000VNĐ/$1.50) is pretty good with a strong, sharp, bitter taste like dark chocolate. Côi Xưa is also a popular place for local businessmen to lunch, so the food here is pretty good. This sprawling, multi-leveled café is built around a man-made stream with trees and ivy growing up around it. It’s big, popular and leans towards the kitsch, but it occupies its own quiet corner of the city and I like the constant bustle of customers – from families to young couples to businessmen – throughout the day. It gets pleasantly busy in the evenings when fairy lights illuminate the ‘stream’. 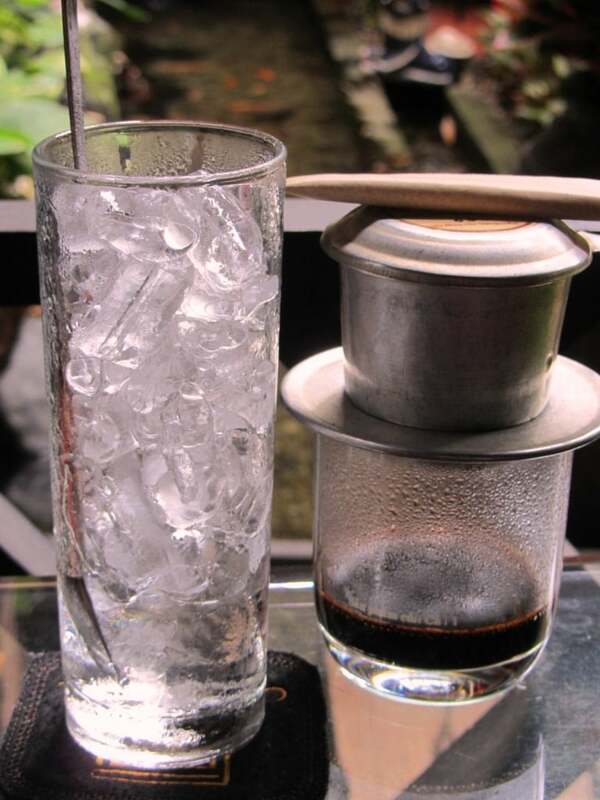 A regular Vietnamese iced coffee is 35,000VNĐ and they also have European-style espresso coffee for a steep 55,000VNĐ. A wide variety of good quality meals and desserts are also served. 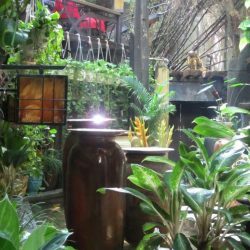 Down a small, quiet alley in a residential part of Phú Nhuận District, Du Miên Café opens up into an unexpectedly spacious and green retreat. 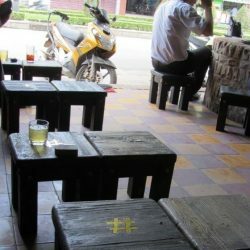 Unlike most of the cafes in this list Du Miên has a thoroughly modern look. 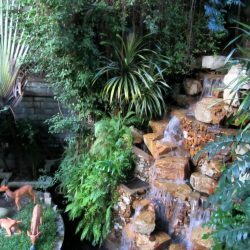 While the ‘soulless’ new furniture and dominant right-angles don’t really appeal to me, this sprawling café is saved by a large amount of greenery and several big water features; the most prominent of which is a 15 foot high waterfall with a group of sculpted deer at the bottom. Yes, it’s rather kitsch, but Vietnam does kitsch better than most. The coffee, which includes European-style espresso, is OK, but for these high prices (40-60,000VNĐ/$2-3) I’d expect better quality. 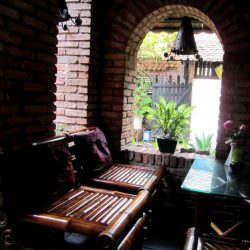 On a narrow lane in Phú Nhuận District this small café is almost invisible from the street behind all the foliage that surrounds it. A deliberately half-built brick structure with broken wooden shutters under a bamboo and palm-leaf roof, Đời Đá Vàng is in the style of a traditional rural Vietnamese home. Indeed, the structures and houses either side of this café look as though they’d be more at home in a provincial village than the middle of Saigon. 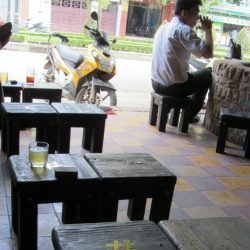 Đời Đá Vàng is a more ‘local’ café than the others in this list. It’s particularly romantic at night when paraffin lamps are lit and – with the sound of cicadas in the hedges – it really does feel as if you’re in the countryside. Coffee is strong and cheap (15,000VNĐ/$0.75). 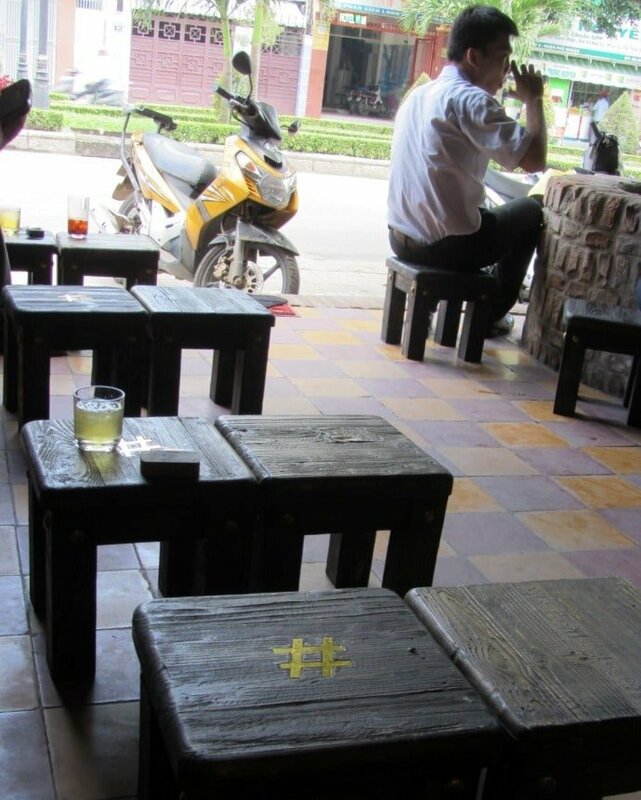 Cheap, cool, small, trendy Pound Café is minimally furnished with low wooden stools in the same vein as Ghế Đẩu Café. Housed in a single bare-brick room with a tiled floor that’s open to the street, customers generally sit on benches along the walls and use the tiny stools as tables. Another option is to sit around the small well/pond near the roadside and use the circular brick structure as a table. 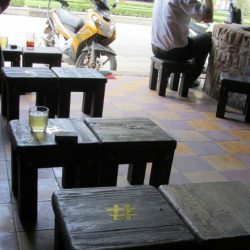 Popular with young locals and their laptops, the coffee here is sweet and smooth, but most of all it’s cheap (15,000VNĐ/$0.75). This simple place is more of an espresso bar than a coffee shop – the kind place where you pop in for a quick injection of caffeine and a chat or to send an email. The name refers to the pound sign, which pops up all over the café. 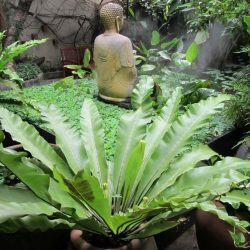 This entry was posted in ALL, DESTINATIONS, Drinks, FOOD & DRINK, Saigon, The South and tagged best, cafes, coffee shops, đẹp nhất, guide, Ho Chi Minh City, quán cafe, Saigon. Bookmark the permalink. 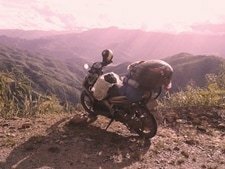 Thanks for your awesome blog. 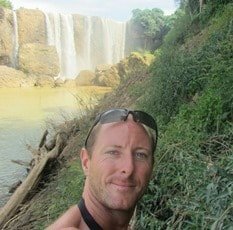 I followed many of your advices in Saigon (Cafe Appartement, Hidden Cafes, Food Ghettos) and had an awesome time. 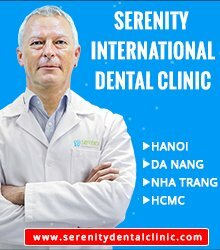 Keep up with your great work and enjoy life in Vietnam! Thanks, Jascha. Great to hear that you enjoyed Saigon. Good to hear you enjoyed Tram Cafe. Yes, it’s certainly is a peaceful oasis. This guide is in need of a full update so please bear that in mind when trying other cafes on the list. Hi, thanks for such a cool blog. 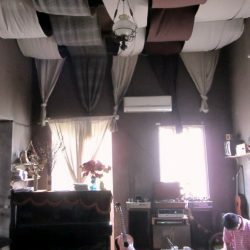 I was wondering which cafe the photo at the top of this article is from ? (Single window with two thin tied white curtains….). It looks exactly my kind of reading spot. (*_*) Thanks. Thanks. The cafe in that photo is Vung Oi. It’s a nice place. Another good reading cafe is Tram Cafe. Please bear in mind that this article is due an update, so I can’t guarantee that all the information is accurate. I’ll be sure to visit both very soon. I’m going to offer up one of my favourite hidden spots…. 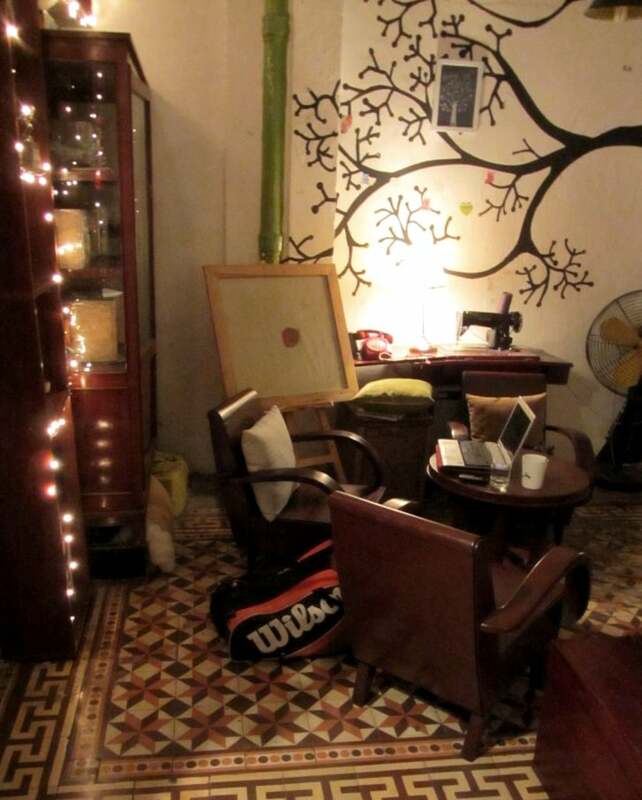 it’s Ciao Cafe at 74-76 Nguyễn Huệ, but the real gem is the third floor which is never busy and simply stunning. 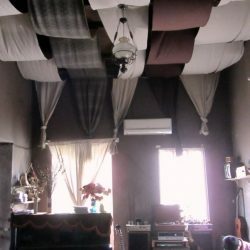 Thanks for sharing your favourite ‘hidden’ cafe. Yes, I like that place too. Wow, this article is exactly what I was looking for! Had an amazing afternoon at Things Cafe. Good job! Thanks! Banksy Cafe changed its name to Snuffbox and is now a bar. Thanks for the update, Michelle. 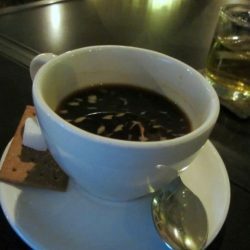 Well, I’m agree with topic’s writer that Bansky is one of the hidden coffee in SG. I came to Bansky in the end of April 2015, the space is quite because they don’t have any guest in that early morning. After I ordered a drink, they started to turn the music on, but it a kind of dance music so it strong and seem like terrible for my peacefull morning. I ask that: Could they turn it lower or change another music. But Bansky’s owner said: “I CAN NOT do that, the coffee shop have to turn that kind of music”. Well, I don’t wanna waste my time for him so I ask for the bill. And he said to the staff that make drink to take away for me. The coffee is not a pure coffee. The soda with color like illustration image (look like fake color not a real one). Sorry to hear you had a bad experience there. 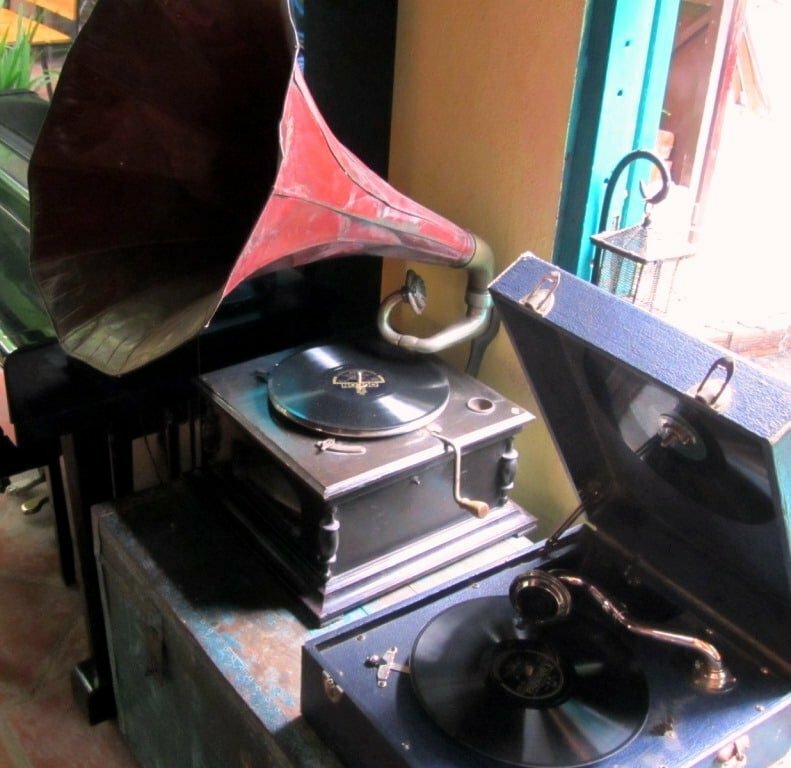 Unfortunately, loud (bad) music is often a problem in any coffee shop you might visit in Vietnam. As for the service – I hope they make more of an enough otherwise they’ll have more dissatisfied customers like you. 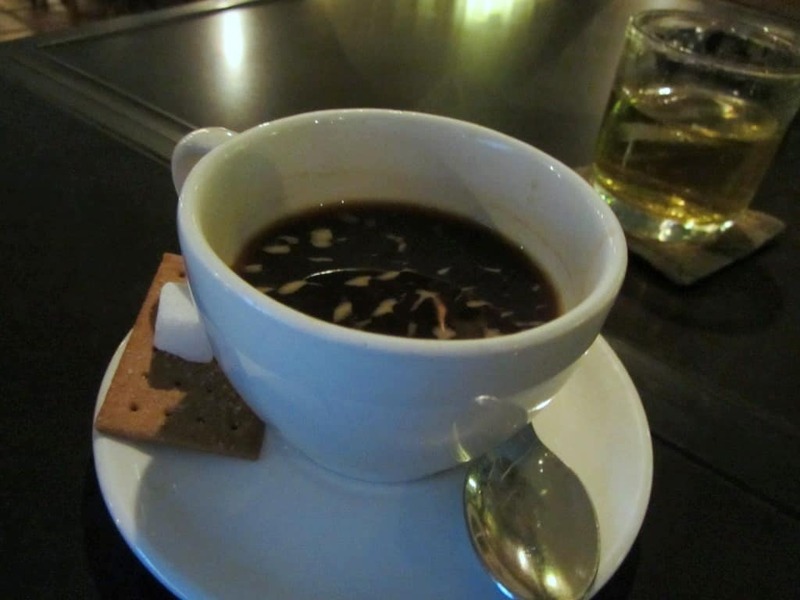 Pingback: Great tea in Saigon but coffee is a bit all over the place | Fancy a Cuppa? And yayyy,The fig is my favorite one. I love it, I’ve been there alot. Thank you alot for this great article. Yes, you are right, thank you, I have now changed it to Ngôi. There are two other quite nice coffee place on the same street as Du Mien, Pergola and S Cafe. Have you checked those out? Pergola used to be my favorite. S cafe is rathernice too.